All families have their myths, and, like most myths they are rooted in truth, but grow fantastic foliage that can obscure the branches of reality that sustain it. Our myth of dad tells of a curmudgeonly unreconstructed enemy of modernity; mainly well-meaning but emotionally stunted; incompetent in most things except the journalistic career that filled his life; a joker whose humour seemed designed as much to exasperate others as to amuse himself. As the youngest by seven years of seven siblings, it’s always been made clear that I got the best of dad as a child, and have only a shadowy sense of malefactions and misdemeanours that have at times been hinted at in the years of his decline since our mum’s death. But we all have our shadows and skeletons, and as I’ve reflected on dad’s death and therefore on my life over the past week I have come to the conclusion that even if I might not always have been as bad as dad, I am certainly not, at least not yet, as good a man as he was. Dad & I playing tennis on Sough Park – ok, this one’s a rarity, but clearly did happen. News came to me that dad had finally given up his ghost when I woke in a tent, in a field at a music festival in Wiltshire and checked my phone for messages. Immediately a family gathering on Facebook began sharing thoughts and memories: a 21st century wake. After an initial flurry of ‘glad he’s found peace at last’ and ‘wish I’d made the effort to go and see him again in time’ type messages, the mood quickly changed to derisive memories of his culinary abominations, and yes: there were many. In prime place was the infamous rice-pudding without rice (not detected until several bowls of sugary milk had been spooned out as the rice was usually a silt of hard grains at the bottom of the pan at the best of times). And of course, when a vegetarian of several years standing, I can never forget him nearly poisoning my (now) wife and me with a chilli-con-carne made with un-soaked kidney beans (and no chilli). We soon returned to a carnivorous diet. But memories of scones deliberately made with sour milk so far gone that you could smell them as the plate entered the room tend to obscure the fact here was an old-fashioned, un-politically correct (for no-one had even heard the term then) male chauvinist pig — who knew where the kitchen was and was prepared to use (and abuse) it. If, in memory, his cooking was worse than mum’s, it’s probably only because she didn’t venture much beyond cheese and toast or egg and chips when she ventured into the kitchen. I remember dad’s Sunday dinners with their delicious Yorkshire pudding, properly made in a big tin and served in slices (not those silly little individual jobs that ‘Aunt Bessie’ mass produces for the freezer), and a properly carved roast, the remnants of which would still be going as the homeopathic ingredient of mum’s hotpot several days later, if dad was occupied by a copy deadline (I still occasionally refer to going to the pub as ‘meeting a deadline’). Dad also baked the most delicious bread rolls, and I have never been able to match the taste and texture of the gorgeous fried egg sandwiches he would make for my breakfast before school (and yes, dear siblings: I know that your memories of schooldays are of trying to prise him out of bed in time to get you to school, but you also know now how sleeping patterns do change as you get older. And drink less.). Dad’s typical Yorkshire tightness was eulogised in family memories from before my time of holidays to Cleveley’s where a local park was passed-off as Blackpool Pleasure Beach, and circuitous routes taken on outings to avoid gift-shops and ice-cream stalls. But who can blame him for minimising the cost with, at the time, six young children in tow? Yet there were always holidays, and day-trips galore, with bottles of pop in a string bag to leave in a stream to cool. By the time my most vivid holiday memories kick in, I had become almost like an only child, with my older siblings off doing their own thing, and dad transformed from lowly local reporter to editor of the Craven Herald, with an income that allowed me a reasonably handsome allowance for book-buying in W H Smiths, or shovelling tuppences into slot machines. Thus funded, I would be left alone for hours while mum and dad went off and did their own thing, whatever that was (and I got a hint of what that was once when I unexpectedly returned early from the amusement arcade to our guest-house room in Teignmouth having had an unusually unlucky streak on the roll-a-coin machine). I often recall my breaking away from the political and social conservatism that I initially inherited from dad, symbolised most strongly in my pinning a ‘CND’ badge to my indie-overcoat as I went out of the door to college for my A-levels in the morning, and removing it before getting back in. Incidentally, I was doing A-levels at Nelson & Colne College having taken the more-or-less unprecedented decision not to stay on at Ermysted’s Grammar School, where dad had been educated too, and would later become a governor. 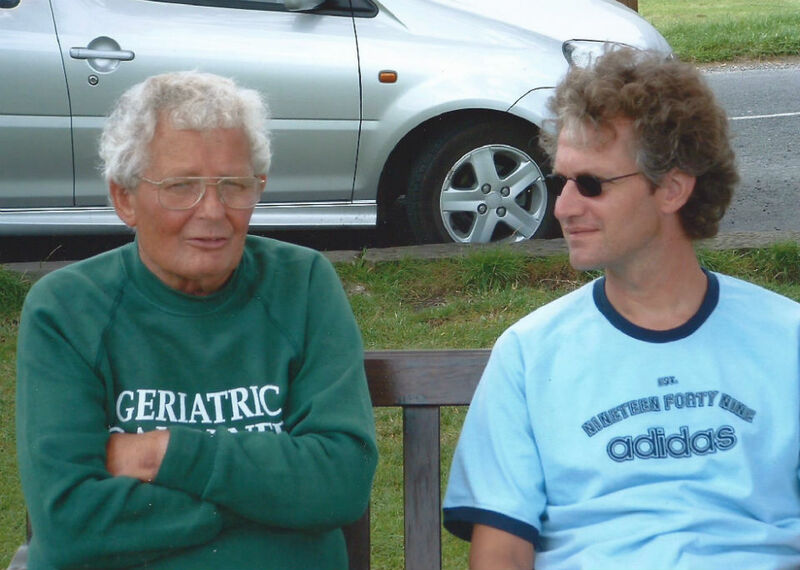 Dad supported that decision, however reluctantly, made on the day my O-level results came out, and although it was Thursday – the hectic day that the paper went to print – he arranged for me to go on from Skipton to Nelson for enrolment. Anyhow, I remember being terrified when Thatcher-loving dad spotted my ‘Victory to the Miners’ badge that must have fallen out of my pocket in the car. I also recall him catching a whiff of joss-stick smoke from my bedroom the night of the Heysel Stadium disaster, and angrily denouncing ‘people like me’ who caused social disorder like that. Of course, what really upset me most about that was not the wrong-headed conflation of football violence and my fledgeling green-tinged leftish-pacifism, but the fact that actually I did care what he thought of me. I wanted him to be proud of me, and I know, now, that he was, when it mattered. The last, albeit indirect, communication I had from him was when my brother texted after I said I was going for interview as an English lecturer the week before he died that “he thinks lecturer sounds very posh and he’s proud.” Well, I didn’t get the job, which rather dents the poignant beauty of this story, but I like the idea that even when he was just about hanging on to the last slender thread of his life he could still muster the energy to bother being proud of me, however misguidedly. How I remember dad best: at work, belly showing, chatting to the local MP at Dales village gala, mum in tow. For all dad’s sometimes reactionary opinions, he was always open to actual, living, in-the-flesh people in a way I’ve never quite managed to be. I might fancy myself as having more liberal and tolerant views but I find it much less easy to mix socially and make friends of people than dad did. You might expect, for example, that he would look at a hitch-hiker and launch into a diatribe about spongers expecting people who’d worked hard to afford the luxury of a car to give them the benefit of it for nothing, and if they can’t afford a car why can’t they get a bus like normal people? I can recall such sermonising from the comfort of his armchair, but in the car, if there was room, he’d pick them up and chat and find out about their lives. If there happened to be a lead for a story, all well and good, but he was genuinely interested in folk. My most vivid hitch-hiker memory was of my being in the car and his picking up a teddy-boy looking type at the foot of Wysick Hill (I had to move from the front-seat to the back: it wouldn’t do to have a child taking precedence over an adult, however infra-dig the latter’s appearance). It transpired he needed a lift to Skipton Magistrates Court, and dad took a seemingly casual delight dad in telling him, “Oh, that’s handy then, I’m on the magistrate’s bench. What are you up for?” I expect the rest of the journey was rather uncomfortable for the young man as he endured a lecture on the woes dad had seen befall the ne’er-do-wells that had passed before his (I imagine rather less than entirely acute) judicial glare. Many of my earliest childhood memories are of just dad and I at home or in the car. As he worked from home as a reporter he could mind me during the day, and take me with him on reporting missions. If ever we heard a klaxon-horn we’d make a Starsky and Hutch style dash for the car. To a very small child, the Hillman Imp Caledonian was a perfectly adequate substitute for the Ford Gran Torino, after all they were both red with a white ‘go-faster stripe’. I like to say that dad was the original ambulance-chaser, but his finest hour at tangling with the emergency services came before I was born when he was among the first to the scene of a series arson attacks often enough for him to become prime suspect for a while. However he gleaned his leads (my sister recalls his number posted in ‘phone boxes for people to ring once they’d called 999), there was always a sheaf of stories typed on the percussive typewriter that chattered and tinged its way through my childhood. Dad, who never sent an email and steadfastly refused even to charge, let alone use, the mobile phone he was given, had what is in retrospect a remarkably innovative solution to filing his copy. I don’t know if he came up with the idea, but he preferred to avoid the office and so when he had his week’s complement of stories typed up, he would bundle them into a neat parcel of brown paper, tied with string, and we would walk the few paces from front-door to bus-stop to wait for the X43 Manchester to Skipton “White Lady” . The package would be put on the bus dashboard “to be met at the station in Skipton”. On Thursday, the day the paper was printed, Dad would often have to go briefly into the Herald office. I can’t really remember why; maybe just to pick up his wages in a manila paper packet. Usually we’d park at the back, behind Skipton High Street, and go in through the printing works with their metallic-inky smell, and the deafening clatter of the presses and huge hot-metal typesetting machines. I would pocket little fragments of used type and be fussed over by the printers and the office-based reporters before we’d head off over the tops for the weekly shop at Morrisons. Yes, backward-looking technophobic dad, who would prefer to drive for an extra three or four hours en-route to the south coast rather than use a motorway, was among the earliest adopters of supermarket shopping, travelling all the way to Keighley for the convenience of a one-stop-shop, and giving me the privilege of a ride in the trolley to boot. Driving back along dry-stone-walled country lanes we would pass the tomato tree (where the discarded remnants of, presumably, someone’s picnic had allowed him to convince me that was where the tomatoes grew), and see someone out walking their Golden Lavatory-door, before passing part of the ‘Early Morning System’ on the approach to Stoney Bank Road and the descent back into Earby, and home. Dad & me at one of his and mum’s favourite places: the green at Burnsall. On other days I might accompany dad as he drove the Barlick & Earby Council of Social Services charity mini-bus, rounding up all the area’s blind folk to take them to their weekly social. Or I’d go with him on his rounds for the Skipton and District League of Hospital Friends, again in a minibus that ferried people to visit relatives at Raikeswood Hospital, and then pushing round a trolley of sweets, hailing and hallooing patients and staff alike. “Are you Jack’s lad?” would come the perpetual refrain (pre-echoing the “Are you Jack’s dad? I would hear from my son’s schoolmates three decades and more later) as I wandered round with him, munching on a chocolate-based freebie from the trolley that compensated for the hospital smell and the less than immediately appealing company of the old and unwell. I wasn’t much better at coping with institutional visits when he was in need of the concern and good cheer, rather than being the one doling it out. Even in his later years when he frankly couldn’t drive safely himself, he was still ferrying old ladies back and forth to church on a Sunday morning, until eventually he had to finally give up the freedom of four wheels after what was an apparently hair raising final journey, shepherded to a roadside halt by twin police cars as a he slipped into a hypo-glycaemic delirium. Even at that point, he was taxiing a one-legged friend back home, I seem to recall (possibly erroneously, but dad never let the facts stand in the way of a decent tale). (well, that’s it: we can stop right there. I wouldn’t be without him.